Place the mustard and miso in mortar or suribachi (Japanese mortar) and blend with a pestle, making sure that the miso is evenly mixed and the mustard is smooth. Set aside while you prepare the tofu. Heat the oil in a large skillet and pan fry the tofu slices on one side for 3 to 4 minutes. Place 2 or 3 drops of shoyu on each slice of tofu. Flip over and fry for 3 to 4 minutes. Continue frying, flipping over occasionally, until both sides are browned. Remove and place two slices on each bottom slice of bread. Spread the miso mustard on the top slices of bread. 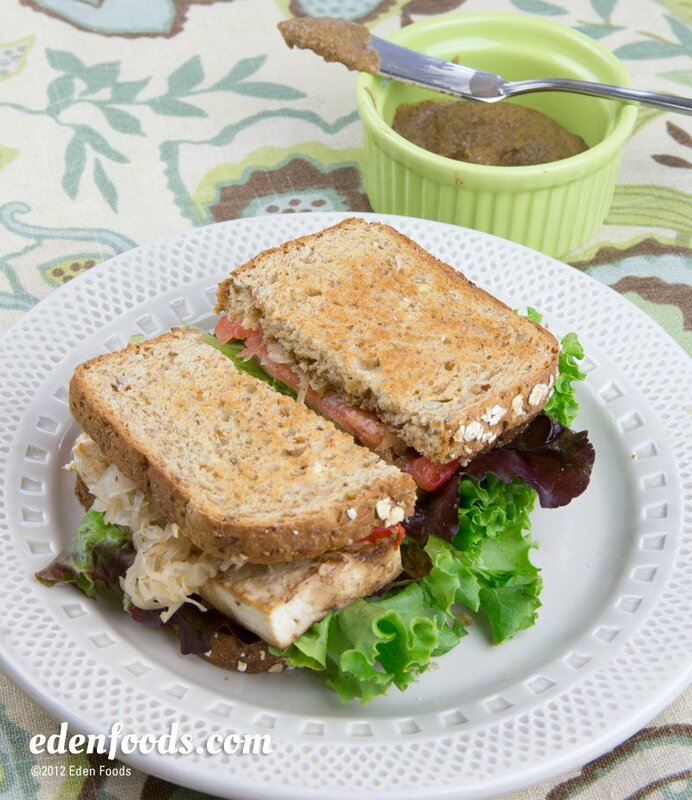 Top each sandwich with equal amounts of sauerkraut, onion, tomato and lettuce. Place the top slice of bread on each sandwich and serve.